Caravaggio used an early form of photography to create his masterpieces - 200 years before the invention of the camera, a researcher has claimed. Roberta Lapucci said the Italian artist - noted for his chiaroscuro (light and shadow) paintings - used "techniques that are the basis of photography". It was already known he worked in a "darkroom" and illuminated his models through a hole in the ceiling. But Ms Lapucci believes the image was also projected on a canvas and "fixed". Light-sensitive substances applied to the canvas would have "fixed" the image for around 30 minutes, allowing Caravaggio to paint the image with broad strokes using white lead mixed with chemicals and minerals that were visible in the dark. Ms Lapucci, who is a teacher at the prestigious Studio Art Centers International in Florence, is the first researcher to suggest the 16th century painter treated the canvas with light-sensitive substances. She believes he could have used a photoluminescent powder from crushed fireflies, which was used at the time to create special effects in theatre productions. 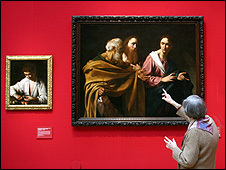 "There is lots of proof, notably the fact that Caravaggio never made preliminary sketches. So it is plausible that he used these 'projections' to paint," she said. Noting that "an abnormal number of his subjects were left-handed," Lapucci said: "That could be explained by the fact that the image projected on the canvas was backwards." She added: "This anomaly disappears in the artist's later works, a sign that the instruments he used were improving. Also thanks to technical progress, his paintings gain a lot in depth of field over the years." Ms Lapucci said the use of such techniques did not detract from the artist's work. "His mastery of certain techniques before his time in no way diminishes his genius. "To the contrary, clearly, you can't just project images on a canvas and copy them to become a Caravaggio."